Haley Lerner is a student at Boston University where she is majoring in Journalism and minoring in Political Science. Haley will be graduating from BU in the spring of 2021. Haley is originally from Long Island, New York and loves spending time in New York City visiting museums, attending concerts, shopping and trying new food. 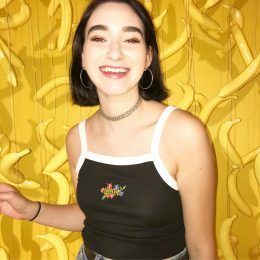 In addition to writing celebrity news for CupidsPulse.com, she works as an associate city news editor at BU’s independent student newspaper, The Daily Free Press. At the DFP, Haley has interviewed a senator and college presidents, covered political protests and elections, reported breaking news and shared the opinions of Boston residents and students. She also models for BU’s fashion magazine, Off the Cuff, and was featured on the cover of the magazine for the Spring 2018 issue. Haley’s passion is to write and hopes to one day become a professional political or arts and culture journalist, where she can hopefully travel around the world. While she loves independent drama films, horror movies and crime television shows, Haley’s guilty pleasure is watching cheesy romantic comedies and The Bachelor franchise. Her favorite celebrity couple is former Bachelor Sean Lowe and wife Catherine Giudici because she loves that they are one of the few couples from the franchise to make their relationship last and enjoys their goofy sense of humor. Haley’s ideal date night would be strolling through an art museum with dinner at a cute café or funky restaurant afterwards.